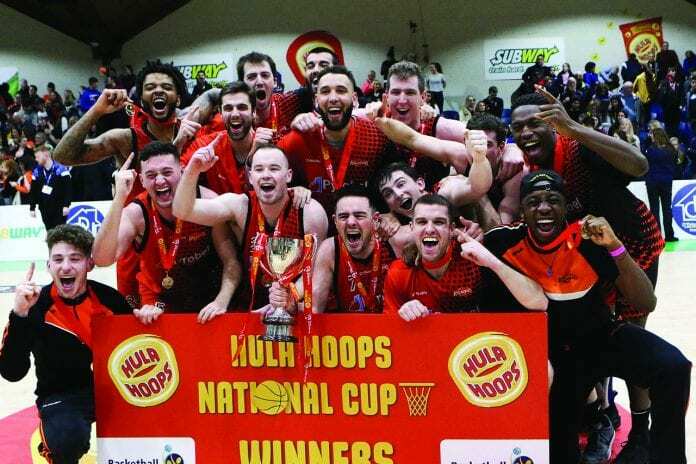 PYROBEL Killester overcame UCD Marian in one of the tightest and most enthralling of Hula Hoops National Basketball Cup finals in Tallaght Arena on Saturday night 66-63, ending a nine year drought in a battle that came down to a frantic final few seconds. A defensive tussle was only settled in the closing seconds. Killester coach Brian O’Malley praised the UCD afterwards, but added that his own team had fought back when it matters. “They’re a really good defensive team. Roe had a few minutes there where he put the team on his back and then Royce Williams made the big shot at the end to get us over the line. It’s justification for the hours they’ve put in and the sacrifices they’ve made,” O’Malley said afterwards. The contest between the two heavyweights had ebbed and flowed from the off, with Killester taking, and then throwing away a substantial lead before ultimately overcoming their rivals in a nip and tuck finale that could easily have gone the other way, despite Marian’s comprehensive defeat of Killester just a week earlier. American Royce Williams was the key man for Killester, with the attacking flair of the boisterous import including some critical three pointers along the way. Williams had been a necessary weapon earlier on in particular, proving the key man in opening up a sturdy and committed UCD defence determined to prevent runs on the basket. No team was able to establish a margin in the early stages, and it was only towards half time that Killester started to edge away, controlling plenty of possession and scoring a series of consecutive points that put them seven in front at the midway break. That was the cue for Marian to show their mettle. The second period has started with four minutes of poor attacking play from both sides, and the third period saw Killester again riddled with the strain of it all, as they went through another misfiring period and UCD made hay, dragging themselves from behind to nine points in front. Killester didn’t fold, though, and had dragged the tallies back to 61 points a piece by the time the clock showed just under a minute left, and the strategy games began. UCD looked to have got their noses in front, when Conor Meany slotted home from close range to give them a two point lead. Williams then popped up with a huge, critical three pointer to put Killester two in front, and UCD were forced to go for full-blown strategy. Twice they fouled Killester players in the hope of getting the ball back in the dying seconds, and as UCD pushed to get the ball in hand, Killester failed to down four consecutive free throws. The last, perhaps, was in their interest. With only a couple of seconds left on the clock, UCD had no time to win the ball back and launch an attack against their nervous-looking opponents. Instead, Killester won the rebound, hit another basket on the buzzer, and got the celebrations underway. Next articleShow us what your part of Dublin used to look like!